When it comes to choosing white kitchen splashbacks, look no further. At HC Supplies, you’ll find a huge array of white splashbacks to choose from and from some of the leading UK white splashbacks kitchen suppliers including M-Stone, Axiom, Duropal, Apollo Magna and so much more. A white splashback is the ideal purchase for the contemporary kitchen setting but can also transform a traditional kitchen design into something spectacular. Why not check our entire splashbacks and worktops collections for a full flavour as to what we have to offer. Offering the ultimate protection for your kitchen walls, our contemporary style white splashbacks are becoming an ever present feature behind worktops up and down the UK. White splashbacks add style and class to any setting but above all, they’re completely heat resistant which means they will not discolour or warp. White glass splashbacks are very popular for the kitchen, you’ll find a stunning range in our comprehensive glass kitchen splashbacks range. Not only are white splashbacks used in kitchens, they’re also a stylish and functional addition to your bathroom when placed behind your sink. Complete your modern kitchen design with our white splashbacks, they’re incredibly easy to clean and protect your kitchen walls from oil splashes, spills and whatever else is thrown at them. Our white kitchen splashback comes in a huge range of patterns in order to help you achieve whatever look you’re after. We stock beautiful white kitchen splashbacks from some of the biggest names in the kitchen manufacturing business. 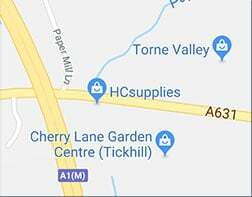 You really are spoilt for choice here at HC Supplies. If a white splashback is not what you’re looking for, we have plenty of alternatives. Check out our steel splashbacks, plastic splashbacks, acrylic splashbacks and glass splashbacks. We have plenty of kitchen splashback colours to choose from too. Here at HC Supplies, we offer top white splashbacks at hugely discounted prices. You’ll be hard pushed to find better savings anywhere else!